Facebook has quietly stepped into the ring with Yelp and Angie’s List. 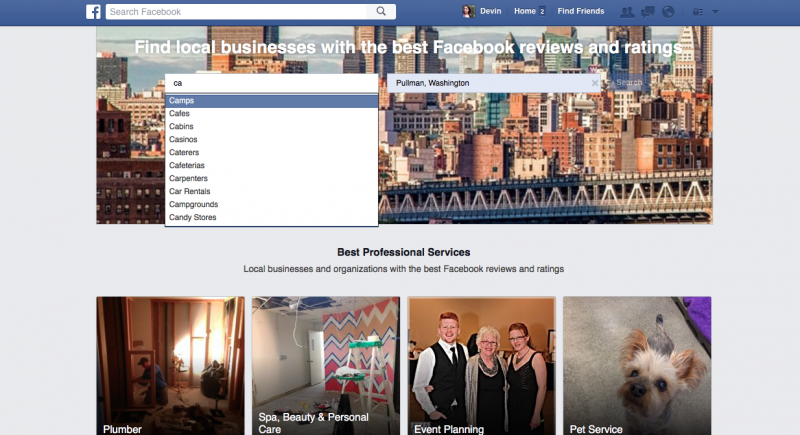 Search Engine Land reports that there’s a new “Facebook Professional Services” feature on Facebook filled with an extensive list of local businesses and services. So far the new feature, which isn’t available on mobile, hasn’t been announced by Facebook. If you visit facebook.com/services you’ll find the above landing page with your location already plugged in. You can change the location or type in a search. Or select one of the featured Best Professional Services tiles in the middle of the page. Scrolling down, you’ll see a complete list of categories at the bottom of the page. This list ranges from Graphic Design and Motorcycles to Psychic and Nutritionist. After you hit the search button, a list of results will pop up complete with ratings, reviews and a map. None of this is groundbreaking... at all. Similar sites have been around a long time and Yelp is generally considered a good enough source of information (plus, some of the ridiculous reviews can be hilarious.) One question is, why hasn't Facebook done this already? The closest the company has come to a Yelp alternative is Facebook Places – the local search directory – and that hasn't come close to killing Yelp. Maybe Facebook Professional Services could work, but first Facebook needs to make it mobile-ready and actually promote it.